SILVER SPRING, Md. --- A massive lobbying effort launched by the Seventh-day Adventist Church to put Ellen G. White on new $10 bills has paid off. Less than a week after news from the US Treasury Department that a redesigned $10 bill would feature a woman, US Treasury Secretary Jack Lew announced that he had chosen White for the special honor. "Although not as widely known outside her denomination, Ellen White is the most translated non-fiction female author in the history of literature," said Lew. "Also, she is the most translated American non-fiction author of either gender. I felt these accomplishments were worthy of some recognition." "We are delighted at the news that Mrs. White will grace our new $10 bills," said General Conference spokesperson Morre Elevant. "She represents all that is best about the American woman: bold, outspoken, resourceful, literally visionary and way ahead of her time." 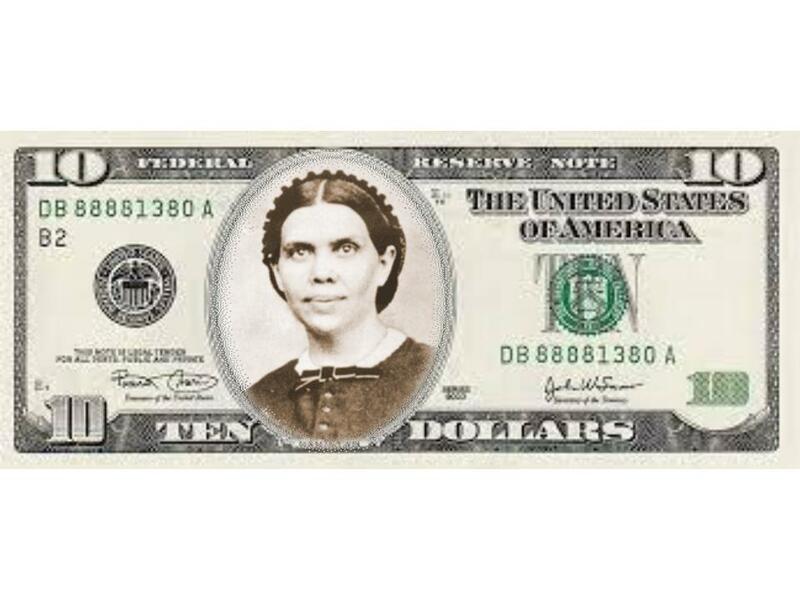 Elevant stressed that having White on the $10 bill will bring a whole new level of visibility for the Adventist church and its female co-founder. "There is also a chance that it will boost our offerings as a church as members will be reminded of their faith every time they are tempted to put a $1 or $5 bill in the offering plate," said Elevant. That text goes against the bible which specifically says men are the ones to hold the pastoral position ie 1_Timothy. The Bible specifically says that people who engage in homosexuality should be stoned to death (Leviticus). So, Adventists should take this literally and start stoning people to death for being gay? The Bible was written by men, not by God, it emerges from the way things were 2,000 and 3,000 years ago. We should look to the Bible for inspiration, not always for literalness. Paul (who seems to have something against women and marriage) says women shouldn’t be ordained, but Jesus doesn’t say that. Paul is not God. CORRECTION. PAUL WAS NOT GOD, HE BE DEAD. Please remember that “Barely Adventist” is purely 100% satirical. It is us laughing at us, and not meant to be taken seriously at all. I hope this helps. If we give “EGW texts,” they want only Bible verses. If we give Bible verses, they want only “EGW texts.” Is that indicative of an open mind? I’LL JUST STICK WITH THE BIBLE THANK YOU. Where in the Bible is a text that say “Bible only”? The word “Bible” isn’t even in the Bible! Only if they say which author she plagiarized her material from. She was so far ahead of her time she could not plagiarize. The passage you are referring to in 1 Timothy 3 outlines the qualities of a leader not the gender. To take this passage literally excludes Paul and David from spiritual leadership because Paul was not married and David had more than one wife. Timothy also says that a Deacon must be the husband of one wife, but Paul commends Phoebe – a woman, as a deacon in the church, so we know that these verses outline those in spiritual leadership should be of good moral standing, loving, generous, sober, not that they have to be male. SHE MEANT MANAGEMENT OF THE CHURCH KITCHEN. Women are to commanded to keep silence in the churches; and who will take the position that they should never say a word in religious meetings? Eve had been perfectly happy by her husband’s side in her Eden home; but, like restless Eves, she was flattered with the hope of entering a higher sphere than that which God had assigned her. In attempting to rise above her original position, SHE FELL FAR BELLOW IT. A similar result will be reached by all who are unwilling to take up cheerfully their life duties in accordance with God’s plan. “The primary object of our college was to afford YOUNG MEN an opportunity to study for the ministry and to prepare young persons OF BOTH SEXES to become workers in the various branches of the cause. . . . Young men moved upon by the Spirit of God to give themselves to the ministry have come to the college for this purpose and have been disappointed.” —5T 60. If you need more evidence, the I guess you just need to pray more and surrender your own SELF. Tremendo engaño, eso no es cierto, ese manuscrito está completamente adulterado. Quien o quienes lo hayan hecho, las plagas caerá sobre ellos. Asi lo dice el Señor en su palabra. money with her face on it will never be in my hand. Ever. YEAH RIGHT, WHAT ABOUT THAT TAT ON YOUR BACK OF EGW? The joke is on you. Just wait until you see the real EGW $10 bill. Don’t believe it? Just read this article. It’s on the Internet, after all! Expect that it will reap a lot of negative comments. I love Barely Adventist’s creative ideas! At GC and other events the church issues their own ‘script’ aka ‘temple shekels’ for Sabbath meals. This is a great design, and about the price of haystack plate. Print up a bunch and bring them to San Antonio. Her pic on $ that we won’t be allowed to use… brilliant muhahaha! “GIVE EGW WHAT IS EGW, AND GOD WHAT IS GOD’S. If this $ bill will come out, are you Adventist members are you happy and ready enough to explain who is E.G White? I guess this is the time of sharing our own organization to others whom of those who doesn’t know her? THAT ONLY COMPLICATES THINGS. STICK WITH SHARING JESUS AND THE GOSPEL. Clever humor here, sevvy. I like the name of the “General Conference spokesperson,” “Morre Elevant.” We do need to make church “more relevant,” don’t we? I would suggest that anyone not attempt to reproduce the $10.00 bill with the EGW pix. This is in violation of the U.S. Treasury Department. It is called counterfieting. Do not pass them around at the GC or anywhere else. Do not allow Pacific Press or any SDA printing facility to print this stuff. Maybe an independent SDA group can get away with it! Otherwise, I will visit you at Levenworth. Woe is me!! Richard, don’t worry. Anyone caught trying to spend this “counterfeit” bill will be lashed with a wet noodle and deported to Miami. Where do you get the guts to make such a lie? AT THE MEAT MARKET, NEXT TO THE DELICIOUS BEEF RIBS. Don’t worry about it, in next 10 years, nobody will use cash anymore. Barely true, fully lie, barely adventist, fully liers. Barely funny, fully corny. Even Sis. White had a sense of humor. She would roll over in her grave to read your comment. This is satire just for jokes, but it has a good point: that the church had an outspoken female leader. She was not “silent in church.” Maybe there’s a lesson for us there. IF SHE WERE TO WAKE UP TODAY, SHE WOULD SCARE ALL THE LITTLE CHILDREN OF THE WORLD. HEY BWEMBYA BWALYA, I CAN TELL YOU GRADUATED FROM THE 3RD GRADE. Fullfilment of the word of god. It appears our leaders are excited about this development. The question is will Mrs. White be excited if she is alive today? After writing extensively about American politics during the end times? Or our leaders are excited about the psychological increase in offerings? Please be wise and sit up. YOU CANT LIVE HER ALONE, SHE BE DEAD. This announcement is a fake. EG White on any US currency is simply not true! How could you–purporting to be a SDA Christian–print such an outrageous lie? IMAGINE AN SDA MONOPOLY! MIGHT SELL. Its confusion, confusion… let we be careful about the matter if there is any truth on it unless we shall comment on anonymous and worthess information. Let we search enough information that will satisfy our mind, then we shall have wise words to to talk to. And Donald Trump has promised to put the picture of Joseph Smith on the $20 bill. Breaking! Just in! The Cruz has promised to be the picture of Pope Francis on the $100 bill, raising the ante! Have you ever seen Harriet Tubman and Ellen White in the same room together? No? Could it be they were the same person? And that’s why Ellen White is actually the new face of the $20 bill? I collect “funny money” where can I get one??? Someone told me they had seen on the internet that EG White was going to feature on the new US $10 bill. I was thrilled and so I googled EG White on US $10 bill and found your article. I took it as gospel. I printed off a few copies of it and gave them to some people I had been outreaching to. I slipped it into the cover of a copy of ” The Great controversy” for these people. I wanted them to know America liked her and also to have a photo of her. My husband, who does not follow EG White and goes to church on Sunday, saw one of these and went to look into it himself. He googled “candidates for the new US $10 bill.” and found that EG White didn’t even get a mention. He let me know and I went back to the original site and had a more thorough look. As I read down the page, I found your disclaimer. Well, the joke was on me. I had better let the other people know. Blessings, Jeannie, Australia.